WTH?! (What the Heck?) moments are attempts to find the memorable and the off-beat perspective on Longhorns sports. Here are some interesting moments from Texas’ matchup with Texas Tech. Pregame WTH Turkey Day?! We all know that the Thanksgiving Day game will always be a home game for the Horns. Will the fans ever be electric after stuffing their faces all day? The revolving opponents will not install much more enthusiasm or the lame senior introductions before kick-off. Get the players away from the end zone and let them stand in front of the entire crowd with their parents at the 50 yard line. Come on Mack… send them off right! 1st Quarter (9:94) WTH Erxleben?! Not only did Ryan get dissed by his Dad’s alma mater and have to go to Lubbock to kick. But this fleet footed soul decided on his own to take off after no one decided to check on him. Fifty one yards later the Red Raiders were on the scoreboard with their only TD of the half. 1st Quarter (:00) WTH Human Tricks?! The biggest ovation of the 1st quarter was when they trot someone out to kick a field goal in front of the “announced” 100,668 in attendance. They need to break out an old fashioned punt, pass, and kick competition to get this tryptophan fan base entertained. 2nd Quarter (:05) WTH Action Jackson?! The defense had an outstanding outing with 9 sacks and great coverage all game long. A huge play was turned in by Jackson Jeffcoat as Tech was 8 yards away from pay dirt. Jackson recorded one of his three sacks on Baker Mayfield which forced a TT field goal. 3rd Quarter (13:57) WTH Replay Booth?! The officials had a terrible day because they ate way too much and they were asleep at the wheel. Even the replay booth official missed on reversing a fumble call on the Horns. Marcus Johnson was stretching for extra yards when the ground caused the fumble. The booth missed another call when a Tech punt returner did not touch the ball. 3rd Quarter (10:04) WTH Royal?! The scoreboard showed another one of Darrell Royal’s favorite saying that you need to dance with the one that brought you. Coach Applewhite took that saying to heart when sticking with the run all game long and producing two 100 yard rushers of Malcolm Brown & Joe Bergeron. 4th Quarter (14:56) WTH Pretty Boy?! Looks like Coach Tom Cruise needs to instill some discipline with his team. Tech was flagged for 11 penalties for 102 yards. Will Smith (not the actor) laid out Mike Davis after he had clearly caught a touchdown pass from Case McCoy. Tech had a frustrating day with their season starting 7-0 and it ended up going 7-5. 4th Quarter (8:14) WTH Officials?! The officials blew another judgment call when they moved the sticks and gave Jalen Overstreet a first down. The replay booth wanted to take a look at it so that Fox Sports could get another commercial timeout since no was really watching by this time. Next up for the Longhorns are the Bears in Waco to say goodbye to Floyd Casey Stadium on Dec. 7th. Thanks for following my WTH articles throughout the season. I appreciate the opportunity to rant about the greatest University sports program in the country. You can continue to follow comments on all of UT sports on twitter at @40AcresSports or follow me at @Horns1991. HOOK EM!! WTH?! (What the Heck?) moments are attempts to find the memorable and the off-beat perspective on Longhorns sports. Here are some interesting moments from the Texas game against the Texas Tech Red Raiders. 1st Quarter (15:00) WTH Lonestar?! The largest crowd ever (60,879) came out to see the new Under Armor uniform which was a shout out to the Lonestar State. It might be a little early to claim the state title with that type of uniform while only beating Texas State and TCU. Maybe the Red Raiders want to replace the Aggies on the State Farm Lonestar Showdown. 2nd Quarter (15:00) WTH Zoro?! It looks like Zoro is going to have to find a new horse. The Masked Rider’s horse Midnight Matador was retired before the start of the 2nd quarter. Ten years as the mascot for the Red Raiders is a pretty good run. Enjoy your time as a stud! 2nd Quarter (13:46) WTH Six Shooter?! Magic Mike Davis may need some etiquette lessons on drawing your weapons. David Ash connected with Davis for a 75 yard bomb to take control of the game. Yosemite Sam may need to give Mike a gun safety course. Hey wait, if you cannot draw your guns, can opposing teams still do the Horns down? 2nd Quarter (5:03) WTH Dagnabbit?! Coach Tommy Tuberville and Coach Duane Akina had a fit with the officials when a phantom late hit call was not enforced. Akina and Tubbs both looked like they were going to have an aneurysm on the sidelines. Tubbs gets extra points for throwing down his plastic play card sheet twice. 2nd Quarter (1:14) WTH Ice Ice Baby?! 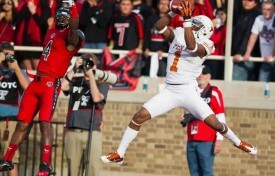 The Horns did a great job of confusing the Red Raiders on defense. It spilled over on to their head coach. Dummerville decide to use a precious commodity by calling a timeout to ice Anthony Fera who ended up making the 42 yard kick. 4th Quarter (13:37) WTH Vortech?! The Vortech is a Texas Tech creation that simulates a tornado. The tornado that got away was Johnathan Gray whose Dad once wore the black and red. Gray started the fourth quarter with an impressive set of first down runs to finish with his second straight 100 yard game. 4th Quarter (5:14) WTH Hands?! Carrington Byndom had a tremendous day using his hands by swatting a crucial 2pt try by the Raiders and knocking down a field goal attempt that would have made it a one possession game. Great game turned in by the defense. 4th Quarter (:28) WTH Bear Hug?! Coach Brown saved his biggest hug for AD DeLoss Dodds who had just seen a tremendous effort and fight by the Longhorns to record its fourth straight win over the Raiders. Next up for the Longhorns is a home date with the Cyclones in Austin on November 10th. It has been a wild roller coaster ride when just a little over two years ago the Longhorns were playing for a National Championship. The Longhorns are a few years away from even been mentioned as title contenders. So, I am going to set the record straight and tell you what the Horns record is going to be game by game. I am even going to give you the record of the opponent when they play Texas. Here goes… nothing. I am predicting a 9-3 year for the Horns. I was way off with my predictions in 2010 with 10 wins (5-7) but I nailed it in 2011 with 7 regular season wins. Anybody can predict the future; just make sure you do not write it down ahead of time. Thanks for following my WTH articles throughout the season. I appreciate the opportunity to rant about the greatest University sports program in the country. You can continue to follow comments on all of UT sports on twitter @40AcresSports or follow me @Horns1991. HOOK EM!! WTH?! (What the Heck?) moments are attempts to find the memorable and the off-beat perspective on Longhorns sports. 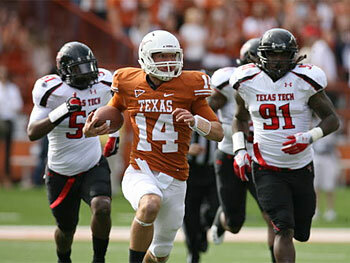 Here are some interesting moments from the Texas’ game against the Red Raiders. David Ash runs for a big gain against Texas Tech. Pre-Game (15:00) WTH Skies?! We owe a big debt to the men and women of the Armed Forces that were in attendance and for those who have lost their life which were shown on the Jumbotron. I thought it was a good sign when the first of the parachute team landed right in the middle of the field on the Longhorn logo. Cool! 2nd Quarter (6:56) WTH Royal?! Fozzy Whittaker ran the wildcat formation to perfection to put two rushing touchdowns on the board and later handing the ball to a streaking D.J. Monroe for another. The Horns racked up 439 yards of rushing with an attitude that has not been seen around here for a while. Wonder if these young Horns remember Coach Royal’s speech about how three things can happen when you pass and two of ’em are bad. Halftime WTH Zorro?! I know that UT Band uniforms look a little outdated, but come on Texas Tech. I believe I have seen that outfit at a local Mexican food establishment. Need salsa with that sir? 3rd Quarter (2:45) WTH Ash?! The future of our passing attack was clearly shown when David Ash threw one of his only seven attempts for a strike to a fast moving target like Marquise Goodwin for 37 yards. David Ash is growing up before our eyes. I really liked the decision by Ash to tuck it and run for 47 yards to end the first quarter. 4th Quarter (1:01) WTH Hat?! Red Raiders offense is the epitome of “All Hat No Cattle”. The offense runs up and down the field for 381 yards of passing but can only score 20 points with the last touchdown coming very late in the game. End of the Game WTH Mizzou?! I know the Big 12 is not the most stable group of teams, but you could see some semblance of getting their act together with the additions of TCU and WVU. A&M wanted out before the season even started. Missouri really started all of this flirting when they saw the Big 10 looking around. Radio personality Paul Finnebaum had a great line when describing the Tigers move to the SEC. A&M is the abused girl looking for a new boyfriend; Missouri is the homely girl at the end of the bar that no one really wants. Next up for the Longhorns is probably the last meeting with the Tigers at 11 AM on November 12th. First off, they have a common ancestor but are run completely differently. I think 10 years after OU won the national title using a hybrid version left behind by Mike Leach and refined by Fat Mark, the original idea has evolved so much that it’s now a package for some teams. The irony is the best example of the Raid in 2010 being a play package probably is OU. They’ve changed things up quite a bit over the years to cater to talents like Adrian Peterson but can still effectively no huddle an opponent in a snap if they decide to. If you really want to get into it – look at Case Keenum and Kevin Sumlin’s offense at Houston. They’ve taken the best parts of the OU hybrid (with an Jenkins-era run n’ shoot receiver at OC), mixed in motion from a bunch of 4.3 40 wideouts jet sweeping and sluggoing you to death, and snap the ball every play when the whistle blows. Mike Leach’s ideal vision was calling six plays repeatedly out of forty different formations and dreaming of going a full season without running the ball. Huge line splits and calling “mesh” six straight times allowed Tech to go downfield 62 yards in 1:28 to knock off #1 UT a couple of seasons ago. Leach’s style and attitude toward his offense fits his personality. He’d see if a play worked, regardless of coverage, and put a check next to it. Then he would try another one, and check or cross it off. Then he’d set off with his improved game plan and try to extend the offense’s number of snaps over a game. They did run a little more hurry up if the clock didn’t stop but it wasn’t a true hurry up no huddle spread. He wasn’t going to adjust to beat you – he was more into finding something that worked and then dare a defense to try and shut it down. Brown’s version is going to look much more like the Houston version than the one seen the past few years in Lubbock. Every skill position player has a wristband and every play is called from the sideline. They try and snap the ball within five seconds of the whistle. They’ll run less sets with more plays and try to catch you out of position. Leach likes shallow crossing routes and spacing the field – Brown likes to burn out corners and runs his guys all over the place. They’ll run the ball, too – I don’t think Tech has the personnel yet to do it effectively, but can you imagine a no huddle run-first offense? If it’s clicking and the OL is dominating the front seven on D, damn right Brown will do it. Troy ran the ball 49 times against MTSU and 45 against UNT, both wins with over 250 yards of rushing offense. The struggling Texas basketball team suffered a setback even in a win Saturday against Texas Tech. Early in the game starting point guard [tag]Dogus Balbay[/tag] went down in a non-contact injury and Monday we learned the junior from Turkey had torn the ACL in his left knee. He will at least miss the rest of the season. Balbay, a junior who started 22 of the Longhorn’ 27 games, led the team with 3.9 assists a game. He had a 2.5-to-1 assist-to-turnover ratio. He was also the Longhorns’ best defender. With Balbay done, the Horns will need a guard to step up from among the trio of [tag]JCovan Brown[/tag], [tag]Jai Lucas[/tag], and [tag]Justin Mason[/tag]. A week ago Brown would have been the overwhelming favorite to nab Balbay’s minutes, but after starting two straight games the freshman only played 5 minutes against Tech. Hopefully someone steps up on both ends of the court or the free fall will continue.